Emily Caza invited us to her wedding in Harrisburg Pennsylvania at 5PM on the second of January 2011. Susan and the boys wanted to go so I extended our New Hampshire visit to allow time to drive down there and back, 10 hours each way according to Google Maps. When the time came to actually go only Susan had any enthusiasm for the idea but I could hardly object, having made plans for the trip myself. We left Jackson at 7PM New Year's Day. Susan drove to Portsmouth where we stopped by Diana's to pick up Susan's pea coat which Diana had brought back from Donna's. Diana didn't feel she could join us for dinner but we wen to Radicci's anyhow. Susan and I had roasted vegetables and polenta, more of the latter than the former but better than David's squash ravioli and Daniel's cannelloni nonetheless. We left Portsmouth around 10PM. I drove until just beyond Hartford, past the hotel I'd started to book just before we left Jackson but didn't when Susan told Mom or John that she was ready to go and was just waiting for me. We found a Fairview by Marriott a few miles farther west which was both cheaper and probably nicer than the place in the city, so it worked out. In the morning I drove west on I-84. The weather was cloudy, damp and mild, much like we're accustomed to in Seattle. Patches of snow from the northeaster last week lingered in the woods, dark hardwood trunks rising out of the mist with bare limbs silhouetted against a brightening sky. When we started seeing lots of redtails around the Connecticut-New York border I had Susan take over driving. We counted 10 redtails in the 5 mile stretch either side of the border, and another dozen in 12 miles about 30 miles farther west. The sun came out around the Pennsylvania border and the snow was pretty well gone, or perhaps they were too far west to get much out of the storm in the first place. We drove through miles of beautiful mature hardwood forest in Pennsylvania, both before and after stopping in the gritty town of Scranton for lunch. We ate an ordinary meal at the Downtown Deli with bare storefronts all down the street on the way out of town. the bride's side. Daniel and I both took photos; he got better shots with his D90 and 18-200 than I did with my D300. We took a few photos during the reception but the light in the fellowship hall/gym cast a yellowish-green glow on all exposed skin. Susan loved the meal, salad with a couple of vegan soups and she and the boys really enjoyed seeing Emily and Shannon again. The festivities ended around 9PM so we returned to our motel and after a few minutes of discussion, decided to get part of the nine-hour drive home out of the way before stopping for the night. I was tired so Susan drove with David in the front seat beside her for company. I woke up now and then to provide groggy directions but was asleep when we missed the turn onto I84 in Scranton and didn't wake up for another 45 miles. It was after 1AM when we got back on track and Susan was still feeling good so we kept going. I didn't take over for another 5 hours, by which time we were only an hour or so from Portsmouth. Shortly before Dover NH we discovered that we were nearly out of gas. When we pulled into the gas station, our dashboard display was warning that we had only 1 mile to go before we ran out but it was apparently lying since the pump shut off at 17 gallons and the tank holds 20. We stopped at Miss Wakefield Diner but after eating part of a donut Susan had bought in Dover, I was feeling revived and no-one else was hungry so we continued on to Bea's Cafe in Conway, a decent breakfast place. I was tired the rest of the day but was glad to be home rather than still being on the road. Upgraded John's computer from Vista to Windows 7 this evening. Earlier, Susan and I and the boys and Mom and John followed Sarah and Roger around some of the trails they've built in the woods. Their trails twist and turn through our homely forest visiting boulders and dodging blowdowns, reflecting their philosophy of immersing themselves in nature with minimal impact. David photographed Daniel throwing logs onto the ice along the edge of the river. There's not much snow left on the ground, or ice left in the river, after several sunny days in the high 40's since the snowstorm. While lying in bed this morning I figured out the source of the upper back pain I've been experiencing since falling on the ice two weeks ago. Though my feet slipped out sideways, I managed to turn face down and put my hands up to break my fall, landing with the left side of my upper chest on my fist. The pain originates at the point where the second rib below my clavicle attaches to my sternum. There's a little swelling there and part of my pectoral muscle extending into my left armpit is sore but most of the pain usually seems to get referred to the left side of my upper back, presumably somewhere around the back end of that second rib. Probably a little damage to the ligaments at that attachment point but it is gradually improving. It bothered me a little breathing on the left while swimming yesterday, and still hurts a little when I breathe deeply, cough, blow my nose, move around in bed and so on. No mental energy today. The boys went off with Mom and John and Sarah and Roger to watch Kirsten race in a Nordic event over in Rumford. I helped Susan get together the books and stuff she's shipping back to Washington, then eventually managed to head out for a run. I actually didn't feel too bad physically once I got out. I didn't have much idea where to go; on a whim I ran up the Black Mountain road to its end, then back down and up the Carter Notch Road. I was out about two hours and pretty tired once I started down the Carter Notch Road, having not eaten since breakfast, but I made it home OK. Susan wasn't back from her errands and the others not back from Maine so I had the house to myself for lunch. Susan was tired when she got home so Daniel fixed supper for us, a delicious lentil stew, while the others had the leftover Boeuf Bourgignon that Roger made last night. Sarah and Roger also contributed some delicious roasted potatoes with rosemary and thyme. I had a bit of the beef but was too full from lunch to have more than a taste of Daniel's lentils. Still feeling blah but glad I at least got some exercise today, and some writing done this evening. 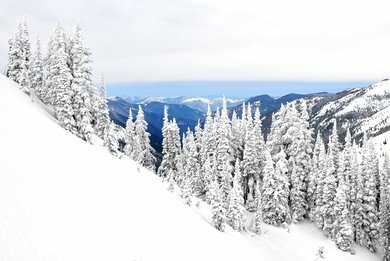 Rain was forecast for the rest of the week before the boys would return to school and David had been wanting to get out snowshoeing so he and Trevor Daniel and I decided to head up to Bullion Basin, up by Crystal Mountain. That used to be one of my favorite areas to tele-ski, and later snowboard, years ago when the boys were young but I hadn't been up there in probably a decade. The trees seemed a little thicker in the lower part of the basin but otherwise it hadn't changed much. We started up the snowcat tracks from the upper parking lot at Crystal around noon and took the usual shortcuts up the increasingly-overgrown former ski trails. Trevor did quite well considering he'd never been on snowshoes before and this wasn't your typical woodland stroll. Daniel and I skinned up, he on his split board and I on my old Nordic gear. Daniel had a bit of a problem with his skins peeling off but I'd re-glued my skins that morning so they held just fine. Our skins worked just about as well as snowshoes on the ascent. The highlight for me was a Northern Pygmy Owl which flew over and perched in a nearby treetop, though too briefly for me to switch to the long lens. We stopped for lunch soon after the trail traversed into the woods from the base of the old burn area. When we were all too cold to eat anymore we continued up the trail into Bullion Basin. Trevor hung out in the basin while David snowshoed up to the ridge and Daniel and I skinned up to the peak. David slid down on Trevor''s blue flying saucer; Daniel reassembled his split board and rode down and I skied down. I hadn't been telemarking in a long time and balancing on the long narrow skis was trickier than I remembered, but I managed. We made it out around dark and met Susan at Ranchitos for dinner, by which time we were pretty worn out. I wrapped up my second week at Microsoft yesterday evening. I didn't see any other offices still occupied as I walked through the halls to the door closest to my car. It was 6:30PM, an hour later than I'd intended to leave but I'd spent at about an hour earlier in the day reading benefit forms and filling out paperwork for Murphy and Associates and I probably shouldn't bill that time anyhow. The sky outside was mottled dirty orange with no stars showing in the dark gaps between the clouds. A damp breeze felt almost warm. I felt an upwelling of joy inside, a feeling of well-being that overtakes me now and then, apparently without reason or cause, and lingers for a few hours or sometimes even a few days before fading away. Maybe it has something to do with working because I felt it earlier this month off and on for the better part of a week and meant to write about it at the time. Compared to my last project at Microsoft, this one is off to a slow start. After two weeks on that project, back in May of 2009 (and coincidentally in the same building, though that group appears to have since moved somewhere else), I'd analyzed the business requirements, documented all the usage scenarios for the application, identified most of the 40-odd stored procedures, built and validated the data model and begun coding. On this project, I've helped the team identify the list of features to include in the next release and begun to understand the data model. Admittedly this application is somewhat more complicated but not that much more. Concerned about my lack of productivity, I mentioned it to Jack a couple of days ago but he reassured me that I'm progressing faster than he expected so he's satisfied. The first few days on the project I felt totally over my head, not just because I didn't know the business or the team but also because everyone seemed technically more knowledgeable than I am. I didn't understand half the acronyms and terminology people were using. The couple of months I spent working in .NET last fall really helped me understand the technical docs though, and I reminded myself that I've always felt this way in the beginning of every new contract and I've always been successful, so not to worry. The two weeks I spent back upgrading the Maniacs site in January, immediately before starting at Microsoft, also helped. Although that was in Classic ASP it included a fair amount of SQL so helped me get back in shape for db work. I'd originally promised the Main Maniacs a site upgrade more than a year ago deferred it to the first quarter of this year then took the Microsoft contract so had to cram three months of Maniacs work into a couple of weeks. I got most of it done but only because I used Classic instead of upgrading to ASP.NET as I'd planned. Two months ago I didn't expect to be doing any more contract db dev work. Joel had called me with an interview at Expedia back in November. I initially agreed to talk to them, then thinking about it more, decided that I didn't want the job (and privately didn't figure I'd pass the interview anyhow, my SQL being pretty rusty). I told Joel I wanted to focus on .NET and he told me he didn't generally have much .NET work and I told him that was OK because I was mostly doing it for the Maniacs and Halffanatics and for my own satisfaction anyhow. We saw Joel and Jenny at the Murphy Christmas party and had a nice visit with them (and also with Erik and Sylvia, who taught the boys to juggle pins). As we were leaving the party, I told Susan that it was probably our last, and that I felt like I was really retired now. Then a few days later Joel called to tell me that he'd been talking with Jack about a db position Jack had open. When Joel mentioned that he'd seen me recently Jack told him I'd be perfect for the job if I was available, and that he might even be able to give me some .NET work if I would join the team as their db developer. Feeling a little disillusioned with the idea of retirement I decided to take the job. David called around lunchtime and asked if I wanted to go canoeing with him. 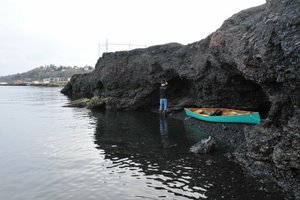 After checking the Commencement Bay web cam, and lacking any other reason not to go since I was just puttering around on the computer, I said sure, I'd bring the canoe and gear and meet him at 2:30, time enough to grab a little lunch, get the canoe loaded up and drive over there. It's been over a year since we had the canoe out so today was the first time I've loaded it onto the new car. Fortunately the new Subaru is about the same size as the old one so the canoe fit well enough. We put in at the little beach east of McCarver Street along Ruston Way shortly after 3 and paddled out along the shore towards Point Defiance with occasional stops for birdwatching (mostly Glaucous- winged and Mew gulls, Barrow's Goldeneyes and Horned Grebes with a flock of Surf Scoters off Point Ruston and scattered individuals of other species along the way. We were able to approach quite closely to flocks of Black Turnstones and Dunlin on rocks along the shore near the Ruston Way Lobster Shoppe; I regretted not bringing the long lens. Beyond an old ferry advertising some new housing development, we began to paddle along an odd-looking rock formation which formed a rough wall 5-10' tall along the water. It looked like dark reddish gray, fine-grained basalt, thinly layered in some areas and more massive or crumbly elsewhere, deposited apparently as a liquid since the face of the wall, where not eroded, was molded in the pattern of corrugated roofing. We concluded that it must be smelter slag since there have not been any local lava flows in recent times. In some places it was stained with blue indicating the presence of copper. In other places we saw 3' parabolic domes of the same material embedded in the flow, and casts of barrels as well. Wave action is cutting sea-caves into the wall and braking the more friable areas down into gravel, even forming a little beach where we landed the canoe and stepped out for a closer inspection. I found the slag to be heavy, due perhaps to high iron content though it doesn't seem to be rusting so maybe more toxic metals are contributing to its density. Later I investigated on the web and learned that our "lava" was slag, 15 million tons of it deposited over nearly a century from the ASARCO lead and copper smelter which operated on the site until about 20 years ago. The slag is composed mostly of an iron silicate called Fayalite but contains other metals as well, including zinc, copper and arsenic which gradually leach out into the Sound and groundwater as the slag erodes and weathers. I also found out that the odd little pool on the point where we turned around was created as part of the habitat remediation effort during site cleanup. The plan was to enclose all the slag in a wall of rock to stop the erosion which accelerates release of toxic metals but with ASARCO's bankruptcy a few years ago the clean up effort appears to have slowed down considerably. We paddled steadily on the way back and covered the three miles in about an hour despite having to paddle upstream in some places. The outflow from the Puyallup river, visible as a sinuous band of brownish water on the far side of the bay as we were descending the 30th street hill on our way to the put-in, had apparently shifted to our side of the bay. We encountered a stream of somewhat muddy water flowing against us at perhaps 1.5mph as we paddled past the last few piers before our take-out but fortunately we were able to get out of the current by turning in and hugging the shore. Daniel was available to join us for dinner at Ferelli's, where together we designed one of the better pizzas I've eaten there - Alfredo base with roasted red peppers, caramelized onion, smoked Gouda, fresh basil and pine nuts. Daniel's IPA was better than my Porter. He had just completed a couple of photo services assignments, shooting a swim meet and a basketball game. From the swim meet he had good news and bad news - the good news was that a man had given him $10 to take some shots of his daughter swimming in the meet; the bad news was that the man's $10 had doubled his income for the assignment. He's been taking pictures for photo services for several weeks now. At his initial interview they asked him how comfortable he was taking photos of people. When Daniel explained that he loved photographing people and was shameless about doing it, they told him that he was exactly the kind of person they were looking for. Back in David's room he and I spent a couple of hours building his first web page, an assignment for his eCommerce computer science class. I showed him how to lay out his site with nested divs and the result works as intended and looks better than most of the sites I've built myself. The color scheme and layout were similar to the site I'm working on at Microsoft, which was apparently also inspired by the Gimp site that David used for a model. I rescued Puss from a tree this evening. I was getting ready to settle down in front of the computer when Susan heard cats yowling in the woods behind the house. When I went out to investigate I had a hard time determining the direction of their growling until I looked up. Puss and a small gray cat, not much more than a kitten, were facing off in the broken top of a cedar about twenty feet off the ground. The gray cat was silent and Puss wasn't growling any more either; instead she was making her mournful sort of cry that means "Help, I'm stuck up here and can't get down". I had to get the ladder since I couldn't reach the lower branches of the cedar. When I started up the ladder the gray kitten got up from her crouch, calmly walked down the nearest limb of the cedar and committed suicide. Or so it appeared. Without making a sound she stepped off the branch and fell. Managing to miss all the branches on the way down, she landed upright with a soft thud in the duff under the tree and ran off. When I reached Puss I was able to hook one leg around a branch so I could have both hands free, but she was still above my head with radiating cedar limbs in the way so I couldn't grab her. Instead I coaxed her to pick her way down through the branches, shinging my flashlight so she could see where to step, until she was at the level of my shoulders. Once I got her front paws on my shoulders I was able to sweep up her back feet with my right arm and climb down the ladder using my left. By the time I got the ladder put away she appeared to have forgotten the whole episode, illustrating one of the differences we've noticed between the cat and our boys. The boys have longer memories. It was three years ago this weekend on a cool sunny Sunday that I ran my fastest marathon ever, finishing in 3:20:45 for a 6 minute PR. That was marathon #57. Three years before that at the same race, running in my 6th marathon, I spotted my first Marathon Maniacs. Though otherwise ordinary-looking middle-aged runners, they stood out at the start because of their bright yellow jackets. I didn't talk to any of them until about a year later when I overtook a couple during the Mt Si 50K and got to ask them about their club. A month after that I joined them. Today's race was called the Valentine Marathon back then. It was put on by the same outfit but they've changed the name to Cupid's marathon and moved the course a few miles to a new location. Their races aren't highly regarded among Maniacs; their prices are a little high for what you get - courses on rural but sometimes busy roads, cotton shirts, tacky medals and mostly junk food at the finish, though in their defense they also serve fruit and some fairly good chili and generally do a decent job of organization. Today was my 104th marathon and though I ended up running it hard I only managed 3:56:12. Despite being stiff and sore at the finish, I had a good day, running all but the first couple of miles with Diana, aka "Slug", from Bellingham. "Slug" is a misnomer - she's a smooth and steady runner, and faster than I am. Today we held a consistent pace somewhat under 9:00/mile for more than 20 miles before I began to slow down. She graciously slowed down with me and we finished the last three at about 10:00/mile. We didn't talk much in the second half but had a nice time visiting in the first 13 miles. She's vegetarian and loved Swee's buttered yams and Spanish-style lentils at the Yours Truly Marathon we put on last weekend, saying it was the best post-race food she's ever had. That's pretty high praise considering this was her 143'rd marathon. I signed up for Gansett because I didn't think I'd ever qualify again; you have to beat your BQ time by 5 minutes to get in. I haven't done two in a weekend since November, and then I had two rest days in between, not just one. All winter I thought about the upcoming double (though technically it isn't even a double since I had Sunday to rest between them) and worried that I wouldn't be able to do it. Even doing two a week apart has been difficult. I haven't been recovering very well, haven't been getting much running in during the weeks between races, haven't been running fast at all. I didn't really taper either since the Mt Si Relay was just last weekend and though I told everyone I was going to take it easy, when it was actually my turn to run I went all out, as usual. I think we all did. You just can't run a relay slowly even when all your teammates say they don't care about time either. I intended to take it easy today and I did. At packet pickup the night before I told the race director I planned to finish in about 5 hours and he assured me that wouldn't be a problem. Susan and I toured most of the course yesterday afternoon after landing in Boston in the morning. Neither of us slept much on the plane. We found our favorite breakfast place in Somerville, the Bell Square Cafe at 708 Broadway, without too much difficulty and each had a big breakfast and some coffee. She drove us down to Rhode Island while I navigated, and slept a bit between turns. We stopped for maps at AAA in Narragansett then found a bathroom in the campground at Fisherman's Memorial State Park. It was a beautiful early spring morning, breezy, cool and sunny. We birded around the park for an hour or so then hit several other spots along the course before we reached Narragansett Pier. A woman I met at the state park had recommended the Coast Guard House so we ate an early dinner there before picking up my race packet. The food was delicious and we sat at a big window right over the water so the birding was pretty good too. I think we were in bed by 8:30 or 9. Today was dry but a cold east wind was blowing in off the water under a gradually thickening overcast. Having birded the area yesterday I wrote a checklist in my notebook before the race to save time while running. It worked well but I missed the two birds I most wanted to see - Common Eider and Brant - despite spotting several others that I hadn't seen yesterday. I ended up with 33 species, not bad considering the wind and the time of year. Birding stops along the water in the first mile ensured that by mile 3 or 4, I was in the running for last place. I started running with Amanda around mile 5 I think. She's a Maniac and though qualified, was not running Boston because of the crowds. She's legally blind due to Retinitis pigmentosa but can still see well enough to run, though not to drive so her boyfriend brought her down to the race. We ran more or less together for all of the first loop and half of the second, though usually I was behind her due to a birding stop or catching up between stops. By around mile 20 we were both pretty chilled, she more so since she was only wearing a singlet while I had a long-sleeved tech shirt and a jacket. Since she was obviously cold and slowing down, I gave her my jacket then ran fast for a few of miles to warm up. At about mile 25 I met her boyfriend and we walked together towards the finish for 5 or 10 minutes and I reported how Amanda was doing. She'd resumed running when I lost sight of her and apparently had kept it up because she soon appeared behind us. Getting cold again, I also resumed running and caught up to Eva # in the final lap around the park, so we finished together, tied for second-to-last place, then ran the final lap again with Amanda. She was pretty beat after the finish. Her boyfriend helped her over to the Village Inn, where she gave me my jacket back. She told me that she'd been getting hypothermic and wouldn't have been able to finish were it not for my jacket. Susan returned from Newport about an hour after I finished. She got my message at the Village Inn desk and met me at the bar in the Coast Guard House for lunch. I had a lobster roll and a brown ale and both were delicious, but the best part was to be sitting inside out of the wind and cold. I ran 3:47:42 today, not quite fast enough to qualify for next year (particularly given the new staggered entry process which will probably cut effective qualifying times by as much as 10 minutes) but well under my target of sub-4:00 and better than my most optimistic projections. I had more concern than usual about even being able to finish the race today since both my left shin and left arch were sore yesterday morning, after seeming to be OK Saturday afternoon after Gansett. The shin problem was the usual anterior tibialis tendon soreness just above my ankle. I favored it all day yesterday and it improved somewhat by the afternoon but I expected it to get sore again today. The arch soreness started Saturday before dinner. The back of my arch suddenly became quite tender when I got up after a nap - a flareup of the plantar fasciatus which bothered me all winter but which I thought had cleared up a few weeks ago. It didn't show up at all today, and neither did the shin irritation - until mile 4, provoked probably by the the downhill grade in the first few miles. I tried altering my stride to minimize the soreness and after a few miles it faded away, whether in response to the gait adjustments or in answer to Susan's prayers I don't know but either way I was grateful. I think new shoes probably helped too. I bought a pair of Brooks ST Racer 5's at the expo yesterday. Racers have worked well for me in the past so I decided to try them today instead of the Launches which I used for Gansett. I'm not sure how many miles I have on the Launches but it's probably too many. The Racers, bright orange with blue laces, felt great and gave me no blisters though they did seem to bother my half-grown right big toenail for a while. The new nail has become a bit ingrown as it replaces the old one which broke after some race last fall or winter. Conditions were perfect for today's Boston Marathon, as evidenced by the new world record of 2:03:02 set by the winner. We ran under blue skies with a cool west wind at our backs all day. The sun was warm so I ran in a singlet and doused my head with water at most of the water stops. I carried four gels and ate 5 1/2, most of them in the second half. My legs felt OK though still a little stiff and beat up from Saturday. As a result I ran the downhills tenderly, probably a minute a mile more slowly than I otherwise would have except in the few places where I could get off the pavement onto sand or grass shoulders. I was the first one aboard my bus along the Common, having just missed the previous bus. Tony, Chris and Steve boarded behind me. I sat with Tony and we talked about the setup process for new Maniacs. It's taking too much of Marc's time. Though I'm too busy to do anything about it until July, I think we can automate most of it; currently all the data goes to Databar with the payment, then Marc has to retype it all into the Maniacs site. Tony and I lost Chris and Steve as soon as we entered the Athlete's Village but we hung out together until the first wave was called up. We spent most of our time in Porta-potty lines (which were shortest over by the gear-bag buses). After a while we found Larry Macon and he and I chatted until it was my turn to go. Larry, as usual, won't be in San Antonio when we're there; he'll be on the east coast running a triple marathon. Somehow I managed to be late for my wave. After weaving through 50 yards of shoulder-to-shoulder runners I reached my corral and it was already empty - the tail end of wave two was just disappearing over the crest of the hill at the starting line. I jogged up the hill with a handful of other late arrivals, taking my time in hopes that my GPS would find satelites before I reached the start. It did. I ran the first four miles a bit gingerly. My legs weren't sore but had no spring in them either and I was worried about the shin and the plantar fasciatus. By around mile 5 I felt my energy level picking up so put off the first gel until mile 7 or so. By 10 I was feeling pretty good. At a waterstop around mile 12 I washed and dried my face so I wouldn't gross out the Wellesley girls too much. Their screaming was even louder than last year - I think the nice weather helped. I kissed one from Texas, another whose sign promised she wouldn't tell my wife. I'd kissed my intended 5 before I was halfway down the line, so I kissed one more to make up for my first Boston when I was too shy to kiss any. At mile 13 I found Alison with her family (Joy, Carol, her mother and Igor) and gave her a hug, almost knocking her over - I didn't slow down quite enough. I lingered just long enough for Joy to take a couple of photos. At 1:53:20 I crossed the half-way mat. In the second half I concentrated on running carefully, so as not to aggravate my AT or PF or anything else, and tried to hold a steady pace. I stopped briefly at most of the water stops and once to tie a shoe. I ate my third gel around 19 I think, after the first of the Newton hills, then when that didn't seem to have much effect, ate another. The second one gave me a brief boost but faded quickly so I downed another one, perhaps around mile 23, and started on a sixth but couldn't finish it. My feet started feeling tender on the downhills and my right hip flexor almost gave out a couple of times on the uphills but would improve as soon as I backed off my pace. The screaming of the crowd reverberated in my ears. It was so loud I couldn't tell if my legs were sore or not. I probably passed alot of runners in the last several miles but couldn't really tell because I was so focused on the pavement ahead of me. I'd assumed I'd pick up the common birds - starling, pigeon, House Sparrow, Herring Gull - as I came into the city but I didn't notice a single bird in the whole second half. Once I saw the Citgo sign I picked up my pace; that last mile was my only sub-8:00 split. It was an emotional mile too. I choked up several times and had to gasp aloud to clear my airway. Runners around me probably figured I was on my last legs but I actually didn't feel too bad. When I passed Susan and Mom and John at the Mass Ave underpass I waved and yelled. No point in stopping to talk; I wouldn't have been able to. Many runners around me started sprinting at mile 26 but I just coasted in, so grateful to have made it and to have run so well. This year my bag drop bus was the very last one before Arlington Ave. I didn't see anyone I recognized in the long stream of finishers creeping down Boylston Ave. Once I received my bag I put on sweat pants and my jacket - the sun was warm but the air was cool. I didn't have too much trouble getting dressed. Walking wasn't bad either so I called Susan and told her I wouldn't need a ride. When I reached the Harvard Club I found out that the others had just ordered lunch at the Trident Bookstore. John and Susan returned first, as I recall. I took a shower downstairs just minutes before they closed, then waited a little longer in the dark-paneled lobby until Sarah and Roger returned from lunch. The woman at the desk downstairs had offered me a bag of crushed ice when she learned that I'd just finished the marathon. I alternately iced my shin and heel all the way to New Hampshire and it apparently helped because neither was sore afterwards.